✔️QUALITY THAT LASTS A LIFETIME - At Crocnfrog we only pick the best materials, because we know your child deserves the best. Enjoy our choice of ultra-light, durable and long lasting construction materials, precision perforated with ventilation holes for a breathable bug mesh that lets the fresh air flow and the bug bites out. It's a bug repellent for babies that is odorless, non-topical, and highly reusable. ✔️ENJOY THE OUTDOORS WITH CONFIDENCE - Say goodbye to nasty bug bites, bees and mosquitos from bothering your child outdoors ever again! The Crocnfrog baby mosquito net for strollers offers complete child protection for your little loved one so you can enjoy the great outdoors together in complete confidence! Acting like a baby bug repellent, our mosquito screen provides full protection against most flying insects, making this the perfect baby camping and baby travel gear for your peace of mind. ✔️HASSLE FREE-PROTECTION MADE SIMPLE - We know installing black mosquito netting can be a pain - but that's exactly why we've meticulously researched the right size to take care of all of the installation for you. With its perfect sizing of 44 x 47 cm, just pop it on and enjoy the outdoors with your baby. It's that simple! 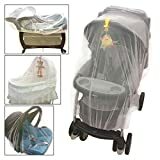 The mosquito mesh is also odorless, unlike other unnatural forms of protection like baby insect repellents and sprays, making this a truly hassle-free baby travel gear. ✔️OUR PROMISE - We stand by our product quality so much that we guarantee your satisfaction. that you will love our product. Try our product risk-free. If for any reason you don't love it as much as we do, we'll refund your mosquito netting for infant, no questions asked. So don't just read about why Crocnfrog is the one for you, add to cart now and get ready to discover the Crocnfrog difference! BUY NOW, with 100% Money Back Guarantee. Order this bug net as a playyard netting for a friend too!